Madeleine Harris-Callway is a traditionally published crime writer. Her debut novel, Windigo Fire, which has a northern Ontario setting, was published by Seraphim Editions in October 2014. It was warmly received by reviewers, including Margaret Cannon of The Globe and Mail. The Huffington Post Canada put it on their list of Books for Book Clubs. On April 23rd, she was thrilled to learn that Windigo Fire is a finalist for this year’s Arthur Ellis Award for Best First Crime Novel. Prior to writing Windigo Fire, Madeleine was a successful crime short story writer. Her stories have appeared in several anthologies and magazines and have also won awards. She has moderated and participated on numerous panels at writing conferences. 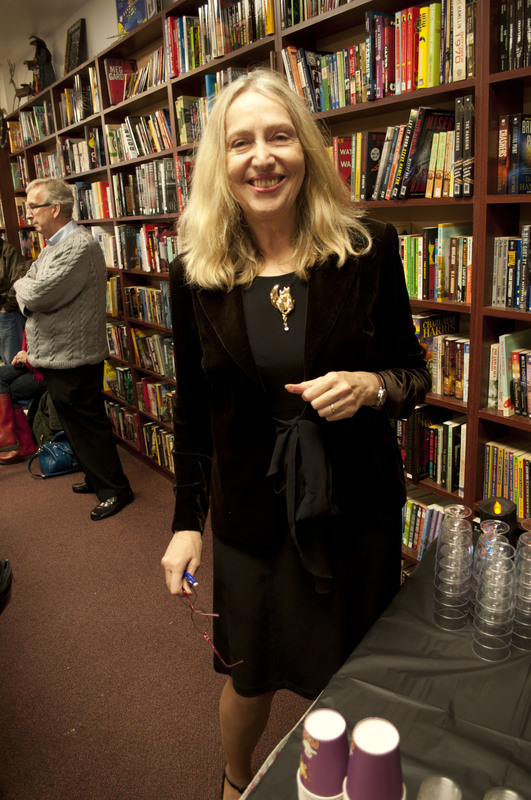 Most recently, she moderated a panel at Left Coast Crime on plot twists. Her favourite topic is “How to Get Published” and she regularly gives talks at public libraries on this subject. In 2013, Madeleine founded The Mesdames of Mayhem, a collective of 16 Canadian women crime writers. I was introduced to Madeleine through a mutual friend, author Dorothy McIntosh (D.J. McIntosh), last year. She mentioned that she would be interested in coming up to Sudbury to promote Windigo Fire, and we started a correspondence that culminated with the organization of a writing workshop and her participation in this year’s Wordstock literary festival. WG: When did you first come to writing, and, as it’s always seemed to be your thing, what drew you to crime writing specifically? MHC: I have been writing since I was a child. I co-opted my mother’s portable electric typewriter and banged out plays for my friends to perform with mixed results! I forgot my dream to be a writer between studying science and business at university, earning a living and raising a family though I returned to it from time to time. In 2002, I decided it was now or never and committed to writing full time. While I worked at the Ministry of Health, I was assigned to work on the scientific investigation of the mysterious deaths at Sick Children’s Hospital in Toronto. The study, in parallel with the police investigation, was headed up by the Centers for Disease Control, Atlanta. The report concluded that deaths were indeed homicide. It was a deeply disturbing experience that affected every one of us who worked on the study. My boss at the time ended up leaving the government and becoming a forensic psychiatrist! He and I would have many long discussions puzzling over the motivation of the person responsible. I began to read accounts of true crimes, trying to gain insight into the criminal mind and I continue to read such books to this day though I’ve come to believe that the reasons, at least to me, remain unknowable. I turned instead to crime fiction, where the criminals, for the most part, are caught, punished and moral order is restored! WG: You’re an avid cyclist, runner, and downhill skier. Does your physical activity play a role in your creative pursuits? MHC: Physical activity and writing are intertwined my personal life. 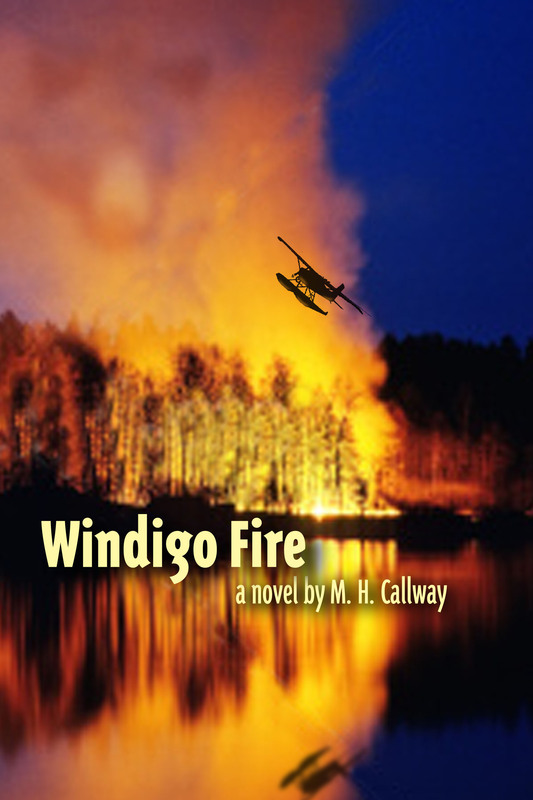 Windigo Fire is an outdoor survivalist thriller. I drew on my personal experiences with dehydration and fatigue to lend authenticity to the hardships my hero, Danny Bluestone, goes through. During long training runs and bicycle rides, I have the freedom to think up stories and to resolve plot problems. And on the way I always spot odd and fascinating people, buildings or incidents that give me ideas. WG: What led you to found the Mesdames of Mayhem? MHC: Sadly women crime writers still face an uphill battle to get equal recognition. Though we represent at least half of published crime writers, we aren’t reviewed as often as men and we don’t win as many awards. My friends and I feel we have greater power by banding together and supporting each other at our new book launches and through social media. Through the Mesdames of Mayhem website and Facebook page, we reach far more readers than we can as individuals. We’ve had great fun doing readings at libraries and other venues. It’s much easier for emerging and mid-list authors to get exposure when we approach libraries and literary events as a team. WG: What was the idea that became Windigo Fire, and how did it evolve? MHC: The first crime novel I wrote became my “learner novel”. Though it had interest from a few publishers and a New York agent, it never quite made it and it now lives in my filing cabinet. Windigo Fire was to be the second novel in the series, but Danny came to life and took over. The story of Pasha, the tame bear at Logan’s zoo, was inspired by a bear we saw performing at Clark’s Trading Post, a roadside attraction in New Hampshire. I was inspired to write Windigo Fire after reading about Ted Nugent’s obsessive advocacy of hunting. At the same time, I ran across a sad story about canned bear hunts or fake hunts where the poor animal is chained down and shot by “hunters” who pay a fortune for this. Fortunately these occurrences are rare. Naturally, I asked what if the hunters become the hunted . . . I spent a lot of time in Northern Ontario early on in my working career: my first job was with Lac Minerals, a gold mining company and later on, I ran health studies for the Ontario government. I heard many wild stories from my workmates, some of which, like the wild bear encounter, are true. The event “karaoke strip night” is an exaggeration, of course, though not by much! WG: Windigo Fire is set in northern Ontario and features a native protagonist. What kinds of research did you conduct in the process of writing the novel? MHC: I relied on a friend and fellow writer who was Native Canadian. She explained aspects of culture, such as sweat lodge ceremony and shared her life on and off the reserve. Sadly she passed away so she never knew that Windigo Fire was published. I also did research at the Spadina Road Branch of the Toronto Public Library, which has a great collection of Native Canadian literature. Studying Cree legends, I ran across the story of the windigo, which proved to be the perfect theme for my novel. The windigo is the symbol of evil, a cannibal with a heart of ice that can only be destroyed by fire. I believe Native Canadians used this legendary character to explain the existence of psychopaths. At a deeper level, my novel represents the struggle of the main characters against evil. Do they rise and become strong enough to fight it? Or do they succumb to it and let their hearts turn to ice? For information about surviving in the north, I used the book, How to Survive in the Woods, and for details on uranium mining, I used the internet. WG: Can you give us a hint about what’s coming up in the future for M.H. Callway, author? MHC: Absolutely! I am hard at work on Danny’s next adventure, the second book in the series, called Windigo Ice. Danny survived forest fire season, but now he’s forced to battle the frigid northern winter and a rogue priest bent on bio-warfare. In follow up to our successful first anthology, Thirteen, my group, the Mesdames of Mayhem, will be releasing a second anthology, Thirteen O’Clock. It contains twisted tales of time and crime and will be available on Amazon this fall on Kindle and in printed form. Many thanks, Mel. It was a pleasure to be interviewed! Danny Bluestone, a young Native Canadian, settles for a job at a children’s camp in his Northern Ontario hometown of Red Dog Lake. Local entrepreneur, Meredith Easter, offers Danny some easy money: play the role of native scout for his wealthy hunting buddies. Danny knows that Easter’s roadside attraction, Santa’s Fish Camp, is the front for the local grow-op, and probably more, but the money is his way out of Red Dog Lake. Danny flies the hunters to an island lodge deep in the wilderness. Once there, he learns that he’s part of an illegal bear hunt and is powerless to stop the men from shooting the helpless animal. The following morning, he awakes to find all the hunters but Ricky brutally murdered. Even though each of them believes the other is the killer, Danny and Ricky must team up to escape the forest fire started by the hunters. While his friends in Red Dog Lake struggle to rescue him, Danny falls back on the teachings of his shaman grandmother to survive the bush and the Windigo, the evil spirit that pursues him and Ricky.